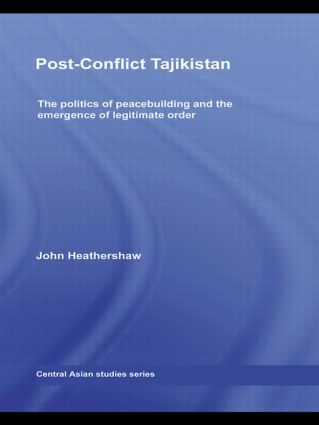 Post-Soviet, post-conflict Tajikistan is an under-studied and poorly understood case in conflict studies literature. Since 2000, this Central Asian state has seen major political violence end, countrywide order emerge and the peace agreement between the parties of the 1990s civil war hold. Superficially, Tajikistan appears to be a case of successful international intervention for liberal peacebuilding, yet the Tajik peace is characterised by authoritarian governance. Via discourse analysis and extensive fieldwork, including participant-observation with international organizations, the author examines how peacebuilding is understood and practised. The book challenges received wisdom that peacebuilding is a process of democratisation or institutionalisation, showing how interventions have inadvertently served to facilitate an increasingly authoritarian peace and fostered popular accommodation and avoidance strategies. Chapters investigate assistance to political parties and elections, the security sector and community development, and illustrate how transformative aims are thwarted whilst ‘success’ is simulated for an audience of international donors. At the same time the book charts the emergence of a legitimate order with properties of authority, sovereignty and livelihoods. Providing a challenge to the theoretical literature on peacebuilding and concentrating on an under-studied Central Asian state, this book will be of interest to academics working on Peace Studies, International Relations and Central Asian Studies.